These are only a few of the reasons why you should hire us as your pool contractor. 1. Our one of a kind, state of the art pool design center allows the customer to select their pool options from one location. 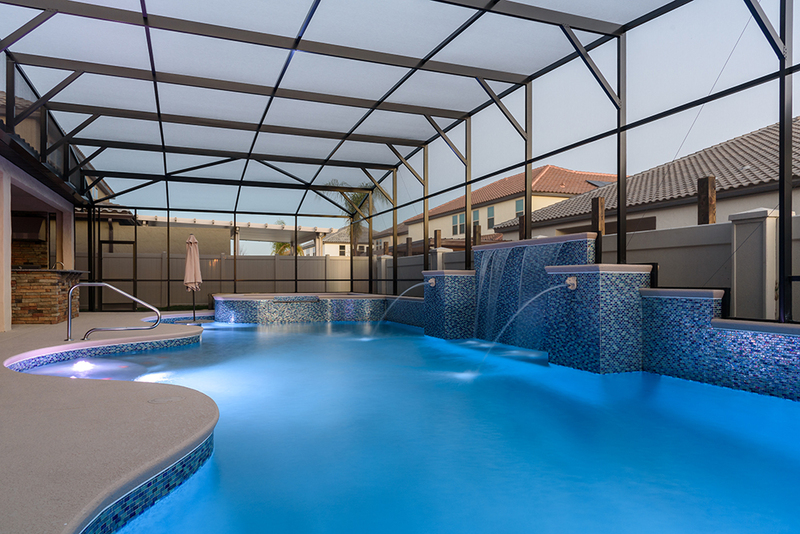 We have an indoor pool and spa SHOWROOM with professional landscaping options. We have on display an outdoor summer kitchen and outdoor furniture options. Select standard pool tiles, along with many, many more pool options from an an inventory much larger than any other pool company. Our long-term commitment to our customer and dedication to selling pools is apparent in our design center. 2. Honesty and Integrity is important to American Pools and Spas. Therefore, we hire and train the best and most qualified employees in the industry. We have sales professionals on staff who are continually trained in the new products and improvements. 3. We offer 3D pool drawings so the customer can see what their swimming pool will look like in their back yard before construction begins. 4. We have a full time service and warranty department that is dedicated to 100% customer satisfaction. 5. We have a research and development team, testing new materials and processes, so we can bring our customers the best swimming pool products on the market. Our superintendents are equipped with iPads in the field with up to the minute information about each customer installation. The interaction with our superintendents and support personnel is key to a successful pool installation. 6. We have a purchasing department that works with our vendors and suppliers to make sure we are getting the best pricing to that we can offer additional savings to our customers.